Plans underway for annual county fair next week – Welcome to Wyandotte Daily! 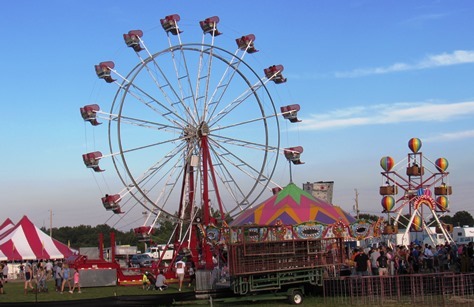 Plans are underway for the annual Wyandotte County Fair, to be held Tuesday, July 10, through Saturday, July 14. This year’s fair will include carnival rides, a petting zoo, a mud run, go-kart races, musical entertainment, refreshments, and animal exhibits, said Wanda Schmieding, secretary of the Wyandotte County Fair Board. If there is a “don’t miss” aspect of the fair this year, for her it would be the food and the animals. “There’s always something interesting, fried doughnuts or funnel cakes,” Schmieding said. Among the several new vendors will be one with small fried doughnuts, she said. Other refreshments available for purchase will include shaved ice, barbecue sandwiches, lemonade and many other food products. There will be 4-H member animal exhibits, as well as a petting zoo, camel rides and pig races at the fair this year, Schmieding said. There are animal shows and judging scheduled throughout the week, with a livestock auction at 7 p.m. Friday, preceded by the bucket calf parade. There will be new lights added to the new barn for the livestock sale. Besides 4-H exhibits, there are also open exhibits in several categories at the fair. Go-kart races will be held at 7 p.m. Friday at the go-kart track, she said. There is no cost to attend. Saturday night will feature a mud run at 7 p.m., with a paid admission to the arena, Schmieding said. Free musical entertainment will take place each night on the free stage under the tent, she said. The Reyes Brothers Band will perform at 7 p.m. Tuesday at the free tent, Schmieding said. Backroad Express will perform at 7 p.m. Wednesday on the free stage, and the Reyes Jr. Band will perform at 7 p.m. Thursday on the free stage, she said. On Friday, the Sully Brothers will perform at 7 p.m., and Saturday will be Alan Thorne Gospel Night at 7 p.m. on the free stage, she added. Another favorite at the annual county fair is the magic show in the big Red Barn. The show is free and there are two shows scheduled each evening, she said. Senior Citizens Day will begin at 11:30 a.m. Friday, July 13, at the fair, in the free tent area, she said. The carnival will have wristband nights each night of the fair. On Tuesday, the cost of wristband night will be $15, compared to $25 on the other nights. There will be some free military displays and vehicles, and a bounce house, she said. The Kansas City, Kansas, Fire Department will have a display for people to tour. Four special open contests will be held at the fair this year. An 8-inch fruit pie contest, with entries received from 10 a.m. to noon Saturday, July 14, at the Red Barn, will offer prizes of $100 for first place, $75 for second place and $25 for third place. Another contest is for items made out of recycled material. The size of the item is 20 by 15. Entries will be received from 7:30 a.m. to 10 a.m. Monday, July 9, at the Red Barn. Prizes are $25 for first place, $15 for second and $10 for third. A Legos contest, for those who are ages 1 to 12, will accept entries from 7:30 a.m. to 10 a.m. Monday, July 9, at the Red Barn. Items built with Legos are not to exceed 20 by 15. Prizes are $15 for first place, $10 for second place and $5 for third place. Then, there is a prize for the best-looking plate of five homegrown tomatoes. The tomatoes can be any variety. Entries will be accepted from 7:30 a.m. to 9 a.m. Tuesday, July 10, at the Red Barn. Prizes are $25, $15 and $10. The contest is sponsored by Torrey Maintenance. Schmieding said she is hoping for a turnout of 30,000 to 40,000 at the fair this year, and a lot will depend on the weather. While there isn’t air-conditioning available at the fair, there might occasionally be a shade tree, a breeze, or a fan in the barn, she said. If it’s hot, individuals may bring in one bottle of water with them, she added, which can be refilled while they are at the fair. Residents should take all the necessary precautions if there is a heat advisory. Schmieding said the fair will be updating its information regularly on its Facebook page and at its website, wycofair.com. There should be more information there about other events at the fair. Hours of the fair are 5 p.m. to 10 p.m. Tuesday through Friday, and noon to 10 p.m. Saturday. Admission is $5 per car. There will be free parking from noon to 5 p.m. Saturday. The county fair is at 13700 Polfer Road, which is east of K-7 on Polfer Road, in Kansas City, Kansas. For more information, see wycofair.com, call 913-788-7898, or visit Facebook under Wyandotte County Fair.